So much is changing in the Forest Park Southeast neighborhood (FPSE), it is hard to get your bearings. This might be one of the best examples of an urban renaissance in our fair city. The amount of rehabs and new construction has been fascinating to watch. No other neighborhood, maybe save for Botanical Heights (BH), has changed as much in recent years. I’ll do a photo roundup of activity in BH next. It will be interesting to see how this level of investment will affect demographics and population numbers in the 2020 Census for both FPSE and BH. For reference, it’s good to take a quick look at the FPSE Census data from 2000-2010. FPSE in recent years has been a majority African-American neighborhood, but it is still diverse by St. Louis standards; meaning, it is a mixed race neighborhood, like most central and southeast city neighborhoods have become in the last 20+ years. The nearly zero diversity neighborhoods remain north of Delmar and the severe southwest city. The 2010 numbers showed that 64% of the population was black, 30% white, 2% Asian and 2% Hispanic/Latino. These numbers bear some interesting trends in the ten year period from 2000 when the neighborhood was 77% black, 18% white, and <1% Asian and Hispanic/Latino. Black people were moving out of FPSE while white, Asian and Hispanic/Latino people were moving in. The population nearly doubled for whites and more than doubled for Asians and Hispanic/Latinos, showing signs of yet another south city neighborhood becoming increasingly diverse and more closely reflective of the overall demographics of the city as a whole. It is always good to see parts of the city where people are living, working and playing together. A sign of hope that we will not self-segregate in modern times as the horrible historic policies of redlining and other discriminatory policies continue to dissolve into the past. Losing ~21% of its population from 2000-2010 may have been in part due to obvious signs of disinvestment and basic care and deferred maintenance, leading to crumbling housing stock. The pictures to prove it can be found all over this website and others. There were 40 less homes counted in 2010 compared to 2000. The population dipped below 3,000. People were leaving, especially adults over 18. As of 2010, 79% of the population was over 18 per 2010 data. I would not be surprised to see more children counted in 2020. Vacancy trends were and are still a real problem for FPSE. A total of 77% of homes were occupied in 2000, and it dropped 5 percentage points by 2010, leaving over a quarter of the homes vacant. But things are on the upswing in large part due to local non-profits and development agencies with links to Washington University and others to look at reversing trends of disinvestment while attempting to stabilize the neighborhood and rebuild a vibrant community where people feel safe and dignified. My hope is that with the smart infill and mix of affordable and market-rate housing, as well as mixed uses of residential, retail, office, non-profits and churches, the neighborhood will increasingly show diversification and be a truly mixed race, mixed demographic, vibrant community once again after the mass exodus this area has seen over the years. I drove through on a grey-skied, cold Sunday a few weeks ago to snap some shots of the current neighborhood state south of Manchester where most of the action is occurring. So here’s a photo dump of the current state of this great neighborhood focusing on the area south of Manchester Avenue. Now, let it be known that many call this neighborhood “The Grove”, I’m fine with that even though I don’t fully understand the meaning. Since the city has not officially changed the name, I’m sticking with FPSE. Let’s start with the Missouri Foundation for Health rehab at the former Columbia Iron Works building. Sadly this is not a net gain for St. Louis as MFH is vacating their space in the Downtown West Neighborhood. But, it’s an inventive rehab and if I’m not mistaken the brick beauties along Tower Grove Avenue are part of the project. Yes, that’s a massive surface parking lot, but with street trees and landscape that is currently being installed, it’ll a bit softened. The Woodward Lofts are completed and now available for lease. This was a 2016 development favorite, click HERE for plenty of “before” photos. It will be great to see more activity on this entrance to FPSE on Tower Grove Avenue. At Hunt and Tower Grove Avenues, across the street from the Woodward Lofts, there is a corner property being developed into a home/work space. Older and new housing is blending in well. 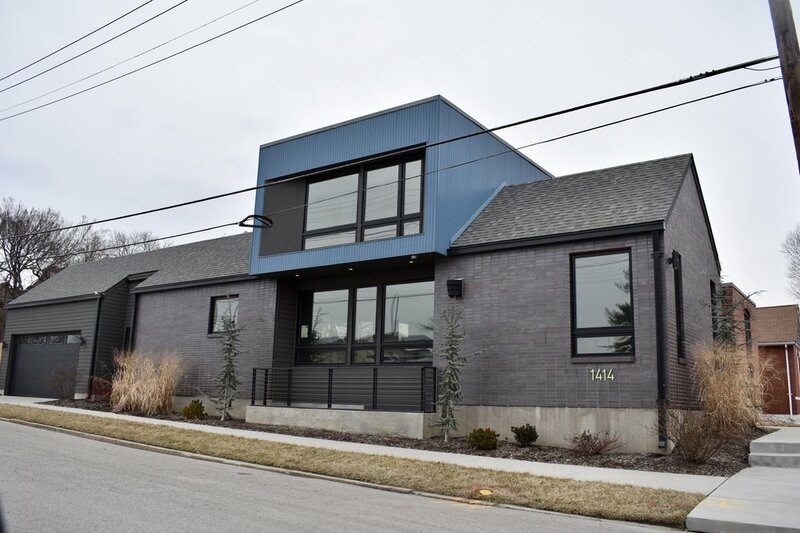 Hopefully these photos show the architectural diversity in the neighborhood that mirrors the racial and economic diversity that has been building over the last 10-20 years.